In the Iliad Sarpedon is carried from the field of battle by Sleep (Hypnos) and Death (Thanatos). Yesterday the Attic red-figured krater depicting this scene was removed from display in the Metropolitan Museum of Art in New York ("Ciao to a Met Prize Returning to Italy", New York Times, January 11, 2008). We have to be grateful to the Met. The acquisition of the krater in 1972 for a record US $1 million was a factor in the decision of the Archaeological Institute of America to pass the December 1973 resolution on the Importation of Antiquities. The siege of Troy was over in a flash compared to the long-running saga of the Sarpedon krater and other disputed antiquities. Although these museums have accepted the Italian case and returned the objects, some of the key individuals (such as Philippe de Montebello) have continued to defend the original acquisitions. This is not the end of the matter. Objects in other European, Japanese and North American museums (and private collections) are said to feature in the Polaroids seized in Geneva. Will it take a few months for those institutions to return the items? Or are we looking for another protracted series of requests? 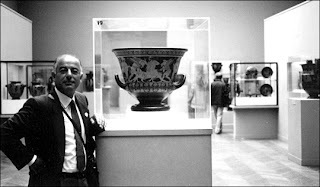 Giacomo Medici and the Sarpedon krater displayed in New York (from a photograph found in the Geneva Freeport). Lee Rosenbaum, "Mourning Sarpedon: Italy's Three Consolation Loans Don't Console", Culturegrrl, has discussed the replacements on loan from Italy.